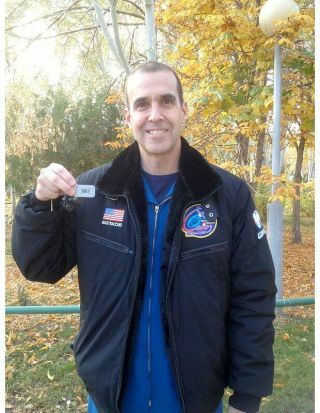 NASA astronaut Rick Mastracchio holding the geocaching travel bug he will fly to the International Space Station, Oct. 26, 2013. The countdown is underway for the launch of a treasure-hunt token to the International Space Station. The same Russian spacecraft that will launch tonight (Nov. 6) with three crew members and an Olympic torch for the orbital outpost is also carrying a "travel bug," a device used to mark the location of a hidden cache or container. On the space station, it will serve as a tool for students and enthusiasts to track the astronaut who is bringing it to space. Mastracchio, together with Roscosmos cosmonaut Mikhail Tyurin, and JAXA (Japan Aerospace Exploration Agency) astronaut Koichi Wakata are set to launch aboard Russia's Soyuz TMA-11M spacecraft atop a Soyuz FG rocket from the Baikonur Cosmodrome in Kazakhstan. Their six-hour, four-orbit journey to the station is scheduled to begin at 11:14 p.m. EST (0414 GMT; 10:14 a.m. Kazakh local time Nov. 7). You can watch the Soyuz launch live on SPACE.com via NASA TV beginning at 10:15 p.m. EST (0315 Nov. 7 GMT). On Earth, geocaching is a "real world, outdoor treasure hunting game using GPS-enabled devices," the activity's official website, Geocaching.com describes. "Participants navigate to a specific set of GPS coordinates and then attempt to find the geocache hidden at that location." There are more than two million geocaches found around the world. Each travel bug is assigned an ID number that corresponds to a cache and a page on Geocaching.com, where those searching for the container can report their find and exchange messages. Mastracchio's travel bug, number TB5JJN1, has a slightly different mission than all the rest: to travel to the space station and then return in six months to Chase Elementary School in Waterbury, Connecticut. The school's fifth grade class, working with the Waterbury Police Activity League, recruited Chase alum Mastracchio to fly the bug. In space, Mastracchio will unite his tag with the first travel bug flown in space, which has been orbiting the Earth for five years. In October 2008, computer game pioneer Richard Garriott, the first second-generation U.S. astronaut, funded his own trip to the space station and brought a travel bug with him. He used the token to mark a geocache that he established on the space station. "I left the bug on the exterior of a panel, which is a generic storage container," Garriott said after his return to Earth. "The cache is the container itself. In my mind, it is only a question of time before another geocacher flies." He was right — although Mastracchio wasn't a geocacher until he was approached by the students in Waterbury, but now he says he thinks its a "great idea." And he doesn't expect any difficulty finding Garriott's cache. "I know where it is, it should be no problem," Mastracchio said. "I will find it and we will take some pictures of it." Those pictures, along with other mission updates, will be posted to the travel bug's web page, where the students at Chase Elementary, the students at ten other "hitchhiker" schools, and geocachers from around the globe will keep track of the token, the mission and Mastracchio. Travel Bug TB5JJN1 and its 11 Expedition 38 hitchhiker tags that NASA astronaut Rick Mastracchio will give to schools after his mission to the International Space Station. To celebrate the the bug's liftoff and to kickoff tracking the mission, geocachers have organized parties to watch live as Mastracchio and his two crew mates leave the planet. "There are over a thousand parties worldwide to watch the launch of this travel bug on its journey to the International Space Station," Mastracchio said. "That is a great thing." According to the calendar on Geocaching.com, the launch parties spread across the globe, from Australia to Austria, the United Kingdom to all but one of the 50 United States (Wyoming being the odd state out). If all proceeds as planned, Soyuz TMA-11M will arrive at the International Space Station with the bug, Mastracchio, Tyurin and Wakata aboard at 5:31 a.m. EST (1031 GMT) Thursday (Nov. 7). The three men and the geocaching tag will remain aboard the orbital lab until May 2014. For more information or to track Rick Mastracchio’s travel bug, see the Geocaching.com website.